Dr. Abel (Michael Simon) is a surgeon who has developed Serum Z, a fluid capable of sustaining life. His next step is to transfer the strong heart from his failing body to that of a dying man. His compatriot, Dr. Ood (Horst Frank) has other plans. During the surgery, Dr. Abel’s heart stops, Dr. Odd removes his head and places it in a device to keep it alive. Dr. Ood furthers his mad experiments by giving a hunchbacked nurse, Karin (Schwester Irene Sander), the body of a stripper. A slumming artist, Paul (Dieter Epper), realizes something is up when his favorite stripper vanishes. I knew virtually nothing about The Head when I started it watching it. With it being a low budget genre film from the late fifties, I had certain expectations.So, it was an expected delight to see that it was shot in such a moody and expressionistic way. 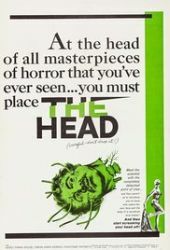 The Head shares a few plot points with The Brain that Wouldn’t Die (1962), and I wouldn't be surprised if the writers of that film had seen this one. The Head is a much more professional production, with some beautiful cinematography and strong performances from everyone on the screen. It is more intellectual and emotional than the The Brain that Wouldn’t Die, but still remembers to be a body-horror movie and engage in some more visceral elements. A much better film than I thought it would be, The Head has been the surprise of my month of Halloween movies.